Bolt went on sale in December 2016 and sent the guys in Yokohama scrambling. 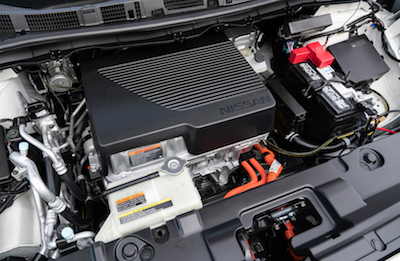 Nissan quickly announced they were readying a new LEAF “PLUS”, referring to the higher-battery capacity and more powerful 160 kW motor to produce 214 horsepower — an increase of 45 percent that adds to the car’s range by approximately 50 percent, up to 226 miles. The new LEAF PLUS was rolled out just after the first of this year and is tested here. For now, it will join the regular 150-mile LEAF that has a starting price of $29,990 before federal income tax (FIT) credits. The LEAF PLUS is offered in a choice of three trim levels with the most affordable starting at $36,550, excluding FIT credits. Not only is the PLUS more powerful with a longer driving range, it also recharges faster, replenishing up to 80 percent in just 45 minutes via a level 2 charging station. 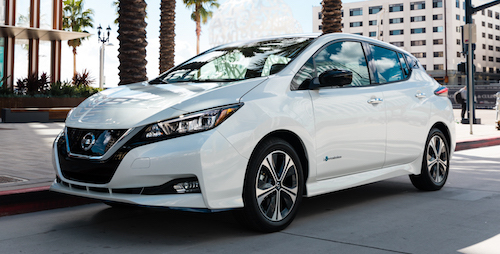 On the road, the LEAF remains a smooth operator with a comfortable ride, excellent off-the-line acceleration, and ample power for highway passing. Handling is superb, parking a snap, visibility good. This is an exceptionally easy vehicle to drive and all operating controls are well-placed and intuitive to use. 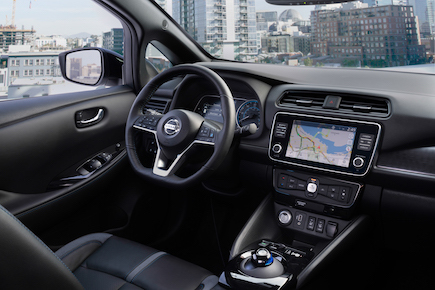 As with the existing LEAF that we previously reviewed, our PLUS came equipped with both e-Pedal regenerative braking option and ProPILOT Assist system. e-Pedal allows the driver to start, accelerate, decelerate and stop using only the accelerator pedal. I drove virtually all of my weeklong test miles using it and gives the driver the option of one-pedal driving, generally rendering the brake pedal unnecessary. Just lift your foot off the accelerator and with e-Pedal mode turned on the car will aggressively slow, pouring power back into the 62 kWh battery pack for additional driving range. ProPILOT Assist is a hands-on driver-assist system for use with highway driving. 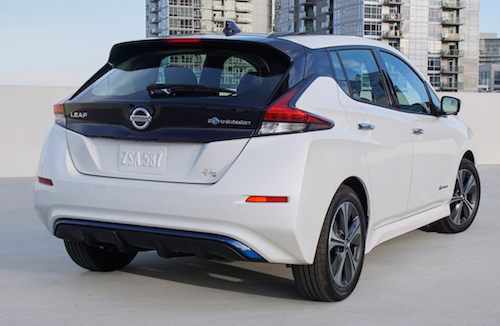 It is not a “self-driving” feature, rather an adaptive cruise control and lane-centering option that calculates the distance between the two lane markings and helps keep the LEAF centered in its lane. It even works on some curves, making it more than a lane keeping assist system. Take your hands off the wheel and within about 10 seconds, you’ll get a warning, both visible and audible, to replace your hands on the wheel. The additional range of the LEAF PLUS, and that of worthy competitors like the Chevrolet Bolt EV (238 miles), Hyundai Kona Electric (258 miles), Kia e-Niro (239 miles) and Kia Soul EV (243 miles), renders the standard-range 150-mile LEAF obsolete. It also moves these vehicles from a “second-car only” option for city commutes to actually having strong consideration as a primary vehicle. For those of you considering the decision to go all-electric the LEAF PLUS is a worthy choice. Of course, you’ll need to install a level 2 home charger but most new public fast-charging sites include at least one CHAdeMO connector along with one or more CCS cables. I was able to plug in for a recharge without cost at my local movie theater and returned with a fully charged battery. Still, while I certainly enjoyed my week with the LEAF PLUS, it doesn’t enjoy any significant advantage over the Bolt, Kona, or Kia. We recommend taking the time to drive all four to make the best choice for your particular needs.